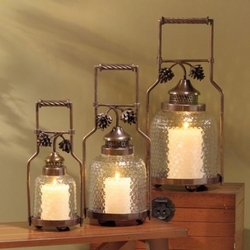 Soften the lighting with these three traditional pinecorn lanterns. Coppery colored metal frames and clear honeycomb glass give this set an antique look. The twisted handle and pinecone features lend a unique rustic look. This set of 3 candle lanterns will make a great gift too! Get a set for you and another for your favorite hostess. She will really appreciate this light! This candle lantern will make a great gift too! Get one for you and for your favorite hostess. She will really appreciate this light! • Copper colored metal and glass construction. • Small is 6 1/4" wide, 5 1/4" deep and 14" high. • Medium is 8" wide, 7" deep and 17 1/2" high. • Large is 9 1/2" wide, 8 3/4" deep and 19 1/2" high.